Sage Gnansambandar has praised the Lord in his Thevaram hymns. 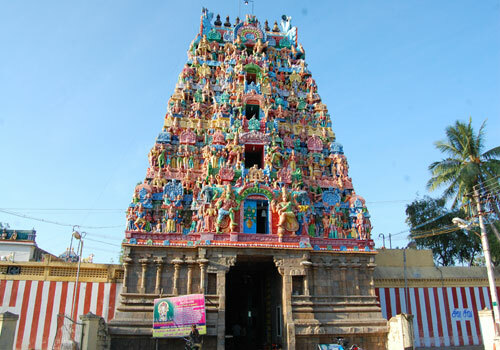 This is the 98th temple on the southern bank of Cauvery mentioned in Thevaram hymns. Transit day of planet Jupiter from one zodiac sign to the next with special pujas, Poornima day (Full moon day) in the month of Chithirai (April-May), Thai poosam in January-February, Panguni Uthiram in March-April and Car festival for Lord Dakshinamurthy are the festivals celebrated in the temple. 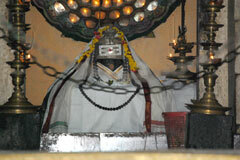 Presiding deity Aabathsahayeswarar is a Swayambulinga Murthy in the temple. Lord Dakshinamurthy adored as Guru Baghwan (teacher of Dharma and Yoga sastras) has special importance in the temple and therefore, the place is regarded as Dakshinamurthy Sthala – the holy place. Sage Viswamitra, emperor Mushukunda and Veerabadra had woshipped in this place. Mother Parvathi performed penance here to have Shiva as Her Lord. Scars of measles are found in the idol of Saint Sudarar. The temple is open from 6 .00 a.m. to 11.00 a.m. and 4.00 p.m. to 8.30 p.m.
Sri Abathsahayeswarar Temple, Alangudi post – 612 801, Kumbakonam Taluk, Thanjavur district. The temple is in the heart of the place Aalangudi. 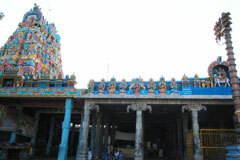 The main tower (Rajagopuram) is of five tiers constructed very aesthetically. 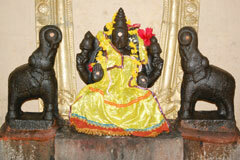 Lord Dakshinamurthy has a significant importance in the temple. There are shrines for Kalangamal Katha Vinayaka, Muruga, Lakshmi, Nalvar (Gnanasambandar, Tirunavukkarasar, Sundarar and Manickavasagar), the authors of Thevaram and Tiruvasagam hymns) Suriyeasar, Somesar, Gurumaswarar, Somanathar, Sabtharishinathar, Vishnunathar, Brahmmesar, collectively known as Sapthalingas, Kasi Viswanathar, Visalakshi, Sage Agasthya in the inner corridor (Prakara) of the temple. 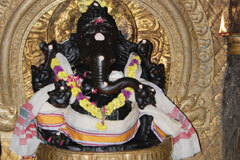 There are procession deities – Big sized Vinayaka, Subramanya, Chandeswara, and Kalyanasastha. The Tirumurai temple is in the Sabanathar shrine. Procession deity Dakshinamurthy graces with four Sanakathi rishis. Those afflicted with snake planet aspects, suffering from some fear and confusion pray to Lord Vinayaka and for removal of obstacles in marriage talks, for achieving excellence in academic field. Devotees perform abishek to the Lord and offer Vastras – clothing. Special abishek and pujas are conducted in the Abathsahayeswarar temple for Guru Dakshinamurthy of Thursday in the month of Masi –February-March. Married women change their Mangalsutra thread. Women with auspicious Guru-Jupiter aspects are lucky ones with long married life. Masi Thursday is considered very important for Guru worship. This day has greater significance in Jupiter-Guru related issues than his transit days from one zodiac sign to the next each year. As there is no direct Jupiter shrine here, Lord Dakshminamurthy, the authority for the planet is worshipped very devotionally here. Dakshinamurthy graces here with four Sanakathi rishis. Sage Viswamitra worshipped here. Alangudian:Aalam in Tamil and Sanskrit means poison of highest intensity which would burn the whole world which sprang up first while churning the milk ocean. When the whole world – earth, pathala the world below and the one above the earth – was trembling with fear of total destruction, Lord Shiva came forward and consumed it to protect the universe. Lord Shiva drank the Aalam, hence the name Aalangudian. "Who said that Aalangudian would not drink (Kudi) the Aalam. If he did not, all in the world would have perished." The reputation of the place is also due to the fact that none is affected by any poison problem in this place. As the holy tree is the black poolai plant, the place is named Tiruirumpoolai and also as Alangudi as the Lord protected the world by consuming the Alam poison while churning the milk ocean. 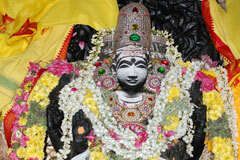 Alangudi is regarded as one of the Pancha Aranya Sthalas – Pancha-five, Aranya-forest covered). 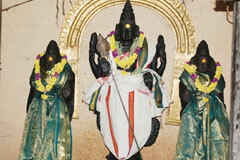 Of the various subsidiary temples attributed to Tiruvidaimarudur Lord Mahalainga Peruman, Alangudi is one. Those worshipping in this temple on Thursdays are blessed with all welfare in life. Those afflicted by snake planet aspects get relief here. This is the only temple where Lord Dakshinamurthy is taken in car procession. There is also a statue of Daksha, father of Mother Parvathi, with a goat head. 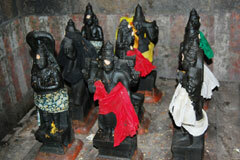 Sundarar: The idol is small and appears a little damaged. This was taken to Tiruvarur once by a king. However, the idol has been brought back to Alangudi by a priest. To escape the constables on the way, the priest told them that he was taking his child suffering from measles. Surprisingly, when the priest unfolded the idol after reaching the Alangudi temple, he found small-pox scars on the statue too which are visible even now. 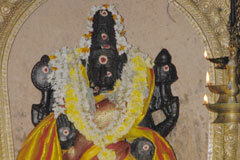 Sukravara Ambica: Firday (Sukravar) is attributed to the worship of Mother-Goddess. 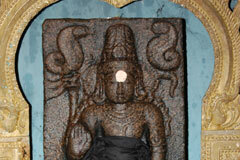 Bearing the same name, Sukravara Ambica graces from a separate shrine. The other significance of the temple is that the structure reminds one the Matha (Mother) Pitha (Father) and Guru (Teacher) philosophy. Entering the temple, we meet Mother-Ambica Shrine first, followed by the presiding deity and the Guru-Dakshinamurthy. While saint Sundarar was caught in the floods while coming to Alangudi, Lord Shiva Himself came to his rescue in a boat and Lord Vinayaka protected the boat from capsizing and therefore is called Kalangamal Katha Vinayaka (Vinayaka who protected from fear of boat capsize). Alangudi is 40 km from Tiruvarur on the Mannargudi route. It can be reached from Kumbakonam also. Bus facilities are available at both ends.